This year marks the 40th anniversary of Yamaha worldwide and its 30th year in Canada. 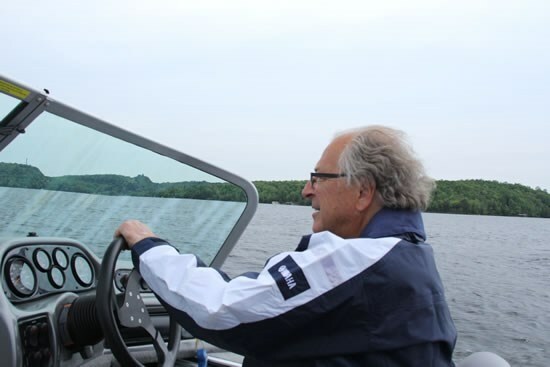 At the tech-talk session we learned that Yamaha just recently celebrated the production of its 10 millionth outboard motor, the first company to achieve that milestone it claimed. The highlight of the session though, revolved around Yamaha’s new F200 outboard motor. 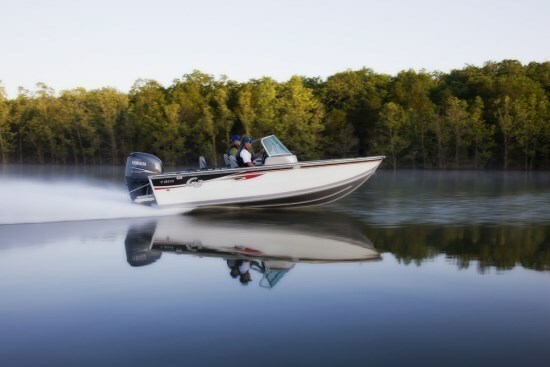 Being an in-line 4-cylinder, it is narrow at only 21.6 inches wide, and with 26-inch mounting centres, Yamaha claims it ideal for twin repowering applications with no need to re-drill the transom. But the biggest news about this new 2.8 litre, four-stroke motor is its weight. At only 487 pounds (220 kg), it is lighter than even some 2-stroke motors of similar horsepower and with Yamaha’s Variable Camshaft Timing System (VCT) operating on its dual overhead camshafts (DOHC) and four valves per cylinder it is claimed to have “the most favourable power-to-weight ratio of any four-stroke 200-hp outboard” and with increased mid-range (2,000-3,500 rpm) torque. And it can be rigged with either digital electronic or mechanical control. We looked forward to putting these claims to test out on the lake the following day. 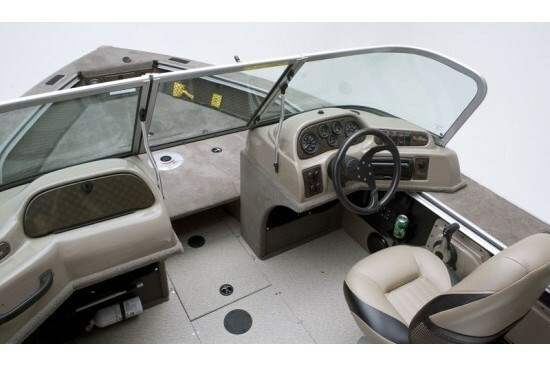 G3 Boats of Lebanon, Missouri is a Yamaha Marine Company which, for 2013, offers a staggering one hundred and fourteen total models of aluminum boats including Angler Deep-V, Eagle Mod-V, Guide-V, and Outfitter-V fishing boats, Gator Tough and regular Jon boats, plus SunCatcher pontoon boats. 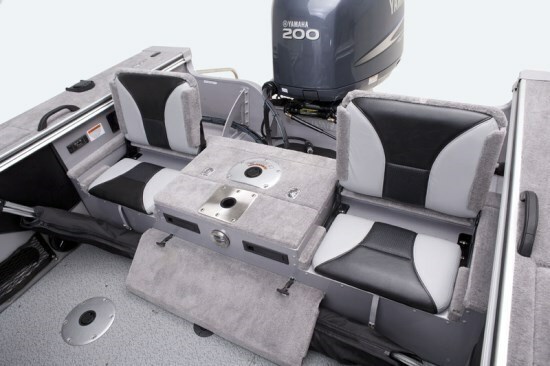 The new for 2013 Angler V185 FS subject of this review, (not to be confused with the Angler V185 FS – a different model) is, at eighteen and a half feet, the largest of the thirteen model Angler Deep-Vee series of riveted aluminum fishing boats which starts at sixteen and a half feet. Versatility is the word G3 uses to describe this new model. 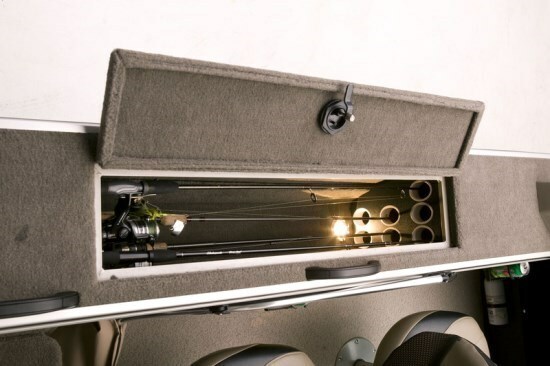 “The new V185 FS is a model that gives the active sportsman and his family all of the versatility of a great fishing boat, and adds sport-boat convenience…” And this boat truly is loaded with convenience and versatility with almost every inch and nook and cranny of it filled with useful features plus storage utilization. Three of G3’s new contoured high back, padded, upholstered fold-down fishing seats, which proved extremely supportive and comfortable during our testing session, are provided along with six seat bases – four in the cockpit and one each on the bow and stern fishing decks – to allow you to choose your perfect fishing location on board. Additional seating useful for family outings is neatly provided by two stern seats that flip up from under the top of the stern fishing deck. Under the port stern seat is a 15-gallon aerated, lighted recirculating livewell with remote drain. 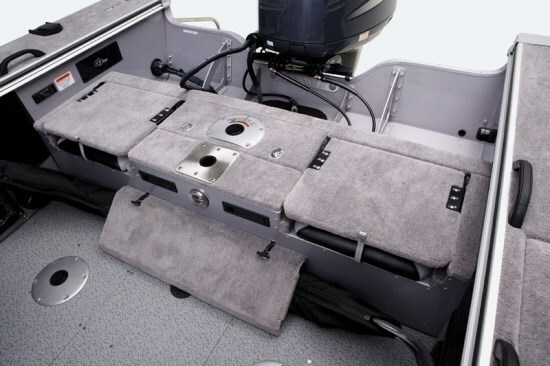 A second similarly equipped 32-inch, 19-gallon livewell is located within the bow fishing deck. Extra-wide gunnels provide top-loading rod storage on the port side and general storage on the starboard side. 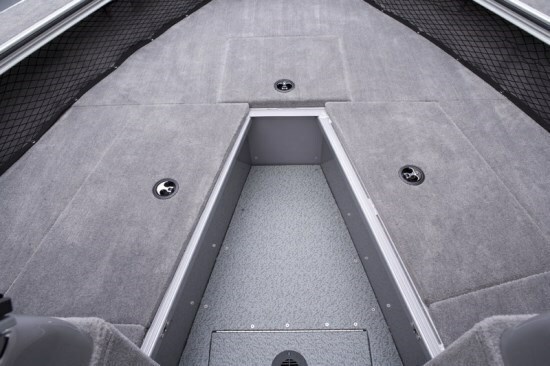 Additional rod storage is down the centre of the bow fishing deck with general lockable storage filling all other areas of the bow and stern decks. Both bow and aft 24-volt trolling motor receptacles are provided to accept your choice from two optional Minn Kota® trolling motors. 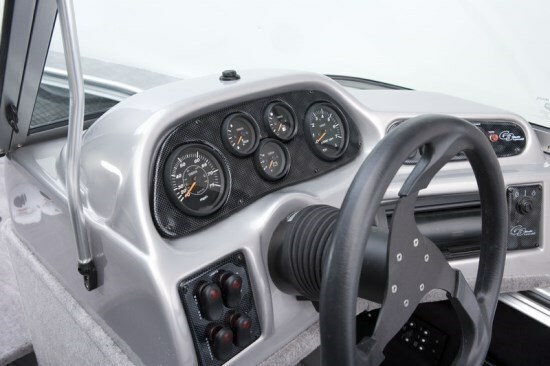 A custom molded fiberglass reinforced console with custom tilt steering wheel and standard hydraulic steering features a speedometer, tachometer, plus trim, fuel, and volt gauge along with a standard Sony® AM/FM CD satellite-ready stereo with USB port for iPod®, iPhone® and MP3 devices. Topping the driver and passenger consoles is a high, wrap-around, centre walk-thru windshield – perfect for our Canadian weather conditions to provide protection from the elements while providing excellent visibility. This feature proved most desirable and practical during the brief squall we experienced while on our water test. What we also experienced out on the water as we put the V185 FS through a tough set of handling exercises on a choppy, windy day, was the very solid, no-rattle or banging construction of this boat. It is solidly constructed with a 3-piece riveted GX2 V-Hull with .100 gauge double plated bow and bottom with a full length riveted keel and concave spray rail plus four lifting strakes to assist in quick planing. Beneath the floor is injected closed cell foam for flotation, added rigidity, plus sound insulation. Waiting to cast off from the dock, I fired up the new Yamaha F200 and let it idle. My passenger’s first comment was, “Is it running?” Let there be no doubt, this motor is quiet. Out on the lake, the V185 FS was on plane an instant after just touching the throttle and just as quickly settled in to a relaxing 3000 RPM showing 24 mph on my GPS. 4000 RPM produced 35 mph and wide open throttle 5700 RPM gave us a remarkable over 52 mph – and all with very neutral handling characteristics. This model is also available with Yamaha’s F115 or F150 motors providing claimed top speeds of 39 and 48 mph respectively. It was a pleasure to relax and cruise or to “hit it” and run full out to the next fishing hole with a no nonsense “get the job done” attitude. We loved this new boat and the new F200 Yamaha that powered it. Give G3 the last word, “Built tough with all the features needed to tackle big fish and big family fun, these rugged Deep V models are dependable, season after season. Serious fishing or family fun, the V185 FS is built for both.” We couldn’t agree more.